Well it's the last two words for The Craft Barn's Quotes and Lyrics Challenge and we have a choice of HARMONY and/or FAITH. I've chosen to do Harmony and used a quote from Zooey Deschanel - not profound, but allows me to make my postcard Christmassy! 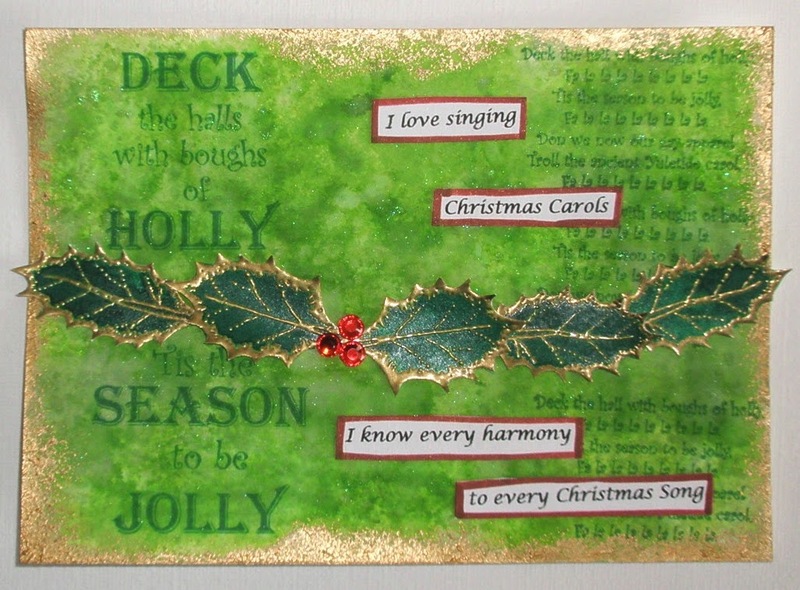 The background is a mix of Mowed Lawn and Bundled Sage Distress Stains, edged with Gold Acrylic paint and stamped with the Deck the Halls stamps from Oak House Studio. The holly leaves are also Oak House Studio stamps, embossed with gold, painted with Emerald Acrylic Ink and hung in a bough. I've just added some gems for holly berries and the quote printed out as usual. My next job is to create an album for them all but before I do that I thought I'd take a photo so you can see all 25 together. It's been a great year - fun creating my postcards and inspiring to visit everyone else's blogs and read other quotes and lyrics. If you've visited my blog during the year thank you so much. If you've left a comment then an even bigger THANK YOU. I'm looking forward to seeing what The Craft Barn have planned for us in 2015. What a perfect postcard to end on Elaine. I love those holly leaves, perfectly cut out. It's wonderful to see your whole collection, collaged, and definitely looking harmonious, imo. Beautiful postcard! What fun to see all your entries together. It has been a really fun challenge & I've enjoyed visiting you and seeing your awesome work. Love the quote - I saw that one too - and your latest postcard is beautiful. How lovely to see them all together. Happy Christmas to you, too. I really like your quote Elaine, it is perfect for this last Challenge. The holly looks real and loving the edges, so sparkly! Thank you for sharing all 25 of your postcards, looks amazing all together. Will do mine during the Xmas break as i have a lot of printing off to do lol. Perfect choice of quote for the season.. Love the green background and embossing. Well done for completing the challenge! A very seasonal and festive page. 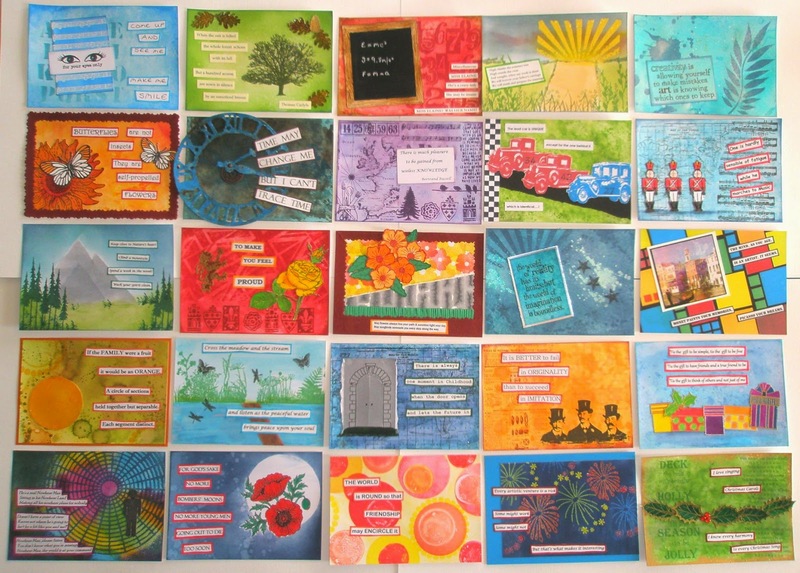 A perfect postcard to end this year's challenge and lovely to see all of your cards together. Look forward to meeting up with you again in the 2015 challenge. Happy new year.